Preferences for lamination adhesives used in flexible food packaging, such as stand-up pouches (SUPs), wrappers and bags, are shifting away from traditional solvent-based products. Environmental and safety issues are the primary drivers for this change. To take advantage of strong projected market growth in flexible packaging by addressing increasing pressure from consumers and government regulators for greater sustainability, the industry is demanding non-solvent alternatives that reduce environmental impact without negatively affecting system costs and productivity. Advanced solventless and water-based adhesive technologies offer solutions to this challenge. According to a report by Smithers Pira, the global consumer flexible packaging market value is forecast to grow at an annual average rate of 3% to reach US$248 billion by 2020. Trends driving this growth include the rise of the middle class in developing economies such as those of China, Indonesia, India and other Asia-Pacific nations. Middle-class families and other busy consumers around the globe increasingly value the convenience of packaged foods offering high quality and freshness. At the same time that they embrace this ‘culture of convenience’, consumers are concerned about sustainability of the packaging used for these foods – from raw materials to energy costs and recyclability. Another major trend is down-gauging of packaging to reduce polymer and production costs and minimize environmental impact. Flexible packaging uses fewer resources and less energy to fabricate and transport than other forms of packaging. As they dry, solvent-based adhesives emit large amounts of volatile organic compounds (VOCs), potentially affecting air quality and worker health and safety. Today, VOCs are being regulated tightly in many nations, including China (Action Plan on Reducing Volatile Organic Compounds in Key Industries). Also, these adhesives require more energy for transport than other types because solvents add significant weight and bulk. Solvent-based adhesive chemistries have other drawbacks. The trace amount of solvent left over in the base materials may lead to potential food safety concern and also produce an unpleasant odor in the packaging that can be transmitted to the food. From a production standpoint, solvent-based adhesives can pose a potential fire and explosion hazard if the processing speed and temperature are too high. These constraints limit productivity for converters and manufacturers. In contrast, water-based and solventless adhesives have no VOC emissions. These adhesives are popular in Europe and the Americas, but represent only about 20% of the market in China, where solvent-based products still dominate. However, upcoming regulations are expected to lead to the replacement of solvent-based adhesives with alternatives offering greater sustainability. New innovations in solventless adhesives have been introduced at a fast pace in recent years. These adhesives are safer and more environmentally friendly than solvent-based products, and they offer cost and efficiency benefits as well. In addition to eliminating the expense of using solvents in the formulation, these products are not constrained by the risk of fire or explosion, enabling them to be run at speeds of up to 600 meters per minute to increase throughput. Advanced solventless adhesives, such as Dow Chemical’s MOR-Free products are designed to enable multi-layer flexible packaging that uses less adhesive while delivering high performance. They have an isocyanate-based material with a hydroxyl-functional base material, and are available as one- and two-component systems. One-component solventless adhesives are used primarily to laminate paper or paperboard with films or aluminum foil. Two-component solventless adhesives are widely used for many general-purpose to medium-performance applications, including laminating of film/film and film/foil constructions. The adhesives are all-in-one solutions for broad suitability for different structures and applications, delivering superior performance that safeguards food safety, for example, by accelerating decay of primary aromatic amines within two days, which potentially eliminates food safety risks and surpasses competitive offerings. With water as their main component, water-based adhesives discharge only moisture into the atmosphere during drying, unlike the VOCs released by solvent-based adhesives. Because no solvents are used, these adhesives do not pose a threat of fire from high temperatures and speeds, allowing them to be processed 20% faster than the average speeds of solvent-based products. These adhesives can be used on the same equipment as solvent-based adhesives, thereby avoiding the capital expense of replacing existing dry lamination equipment. Water-based adhesives also have broader adaptability to different materials. They are compatible with metalized films, and are suitable for structures such as BOPP (PET)/VMCPP, BOPP (PET)/MPET and inflatable food packaging for confectionary products and potato chips. Single-component water-based adhesives are often used for packaging of instant noodles and snack foods. Two-component adhesives can provide higher bond and heat seal strength, and are suitable for some medium-performance applications. 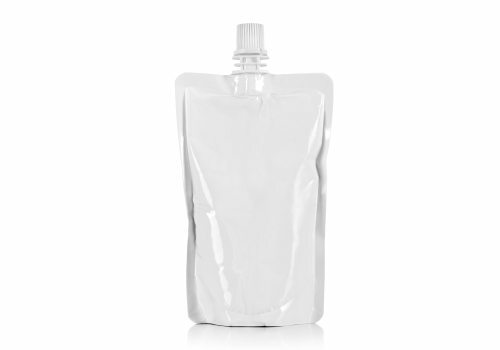 Although many water-based adhesives cannot equal solvent-based products in heat and chemical resistance, which is considered a roadblock to their adoption, Dow Packaging and Specialty Plastics’ new-generation RoBond polyurethane-based laminating adhesives can deliver comparable performance in some applications such as rice bags and SUPs. They offer resistance to steaming, boiling and chemicals for foods such as meats and pickles that are sterilized in boiling water after packaging. Following curing, the RoBond polyurethane dispersion system creates a strong, flexible laminate with good clarity and thermal stability. Solventless and water-based adhesives can be used in the same multilayer packaging construction to deliver different properties. For example, a potato chip bag may appear to consist of one thin layer but is actually a three-layer structure (BOPP//VMPET//PE) requiring two laminating processes. Dow RoBond L-168/CR3A water-based adhesive can be used for the first ply lamination (BOPP//VMPET) due to its suitability for metalized structure lamination and fast curing performance, which enables the next laminating process to be performed in just a few hours. Dow MOR-Free 899A/C99 solventless adhesive is suitable for the second ply lamination (VMPET//PE) because it provides good bonding and resistance properties and also helps to improve productivity for cost savings. This combination of adhesives can help to maximize operational efficiency, reduce manufacturing costs and shorten delivery time to customers, while improving the environmental protection and safety of the food packaging. Replacing traditional solvent-based lamination adhesives in flexible, multi-layer food packaging with water-based and solventless adhesives can help converters and manufacturers address consumer demands for safety and sustainability, as well as comply with increasingly stringent laws and regulations regarding VOC emissions. With its broad portfolio of solventless and water-based adhesives, including new polyurethane dispersions, Dow can provide alternatives that not only reduce or eliminate VOCs but also promote food safety and expedite processing. Article by Dow Packaging and Specialty Plastics.